IceMelz eco consists of a very active granular de-icing material, free of any chloride or salt components; it is the preferred solution to combat slipperiness as a result of snow and/or freezing without corrosion to metals and it maintains its key characteristics also at extreme low temperature. 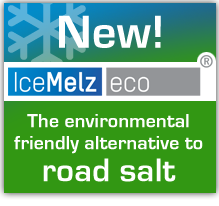 IceMelz eco granules dissolve slowly and remains active 5 times longer than road salts resulting in very attractive competitive costing per square meter treated surface. IceMelz eco is pet-safe, non-damaging to vegetation, and its non-corrosive properties make it safe to use without any personal protection equipment. As soon as IceMelz eco comes into contact with snow or ice an instant exo-energetic reaction is formed, which is a type of contact reaction that releases energy. IceMelz eco is safe for all types of surfaces, metals, materials, floors and pavements and it can be used in areas where corrosive salt and brine is undesirable. IceMelz eco can be stored indefinitely in dry conditions.